Demonstrations for refugees cover the entire U.S.
Chicago—“Families Belong Together!” was the rallying cry for 60,000 people who protested in Chicago June 30. We knew it was going to be big when most of the passengers on the el train were headed for the rally, and one of them said she had seen the previous train jam-packed with protesters. The train operator, an African-American woman, surprised us by announcing not the next stop, but her feelings about the demonstrators. She said, “You are demonstrating even though the humidity makes the temperature feel over 100 degrees!” She expressed her dismay over Trump’s politics and thanked us profusely for protesting. Those in our car exploded with spontaneous applause, which we wished she could have heard. Events were also held in over 700 other cities and towns across the U.S. and some in other countries. Despite sweltering heat, huge crowds gathered in Washington, D.C., New York City, Los Angeles and other cities, including big turnouts in border cities from Texas to California. Many families came out in Chicago, of all different ages and races, most with handmade signs. Speakers included children of immigrants and mothers of detained children. It was clear that protesters were united in passionately opposing the separation of families at the border and the caging of children, and in the sense that the country is going in a horrific direction. After the rally at Daley Plaza, the crowd marched to the Immigration and Customs Enforcement office, where several set up tents, as has been done in Portland, Ore., and other cities. 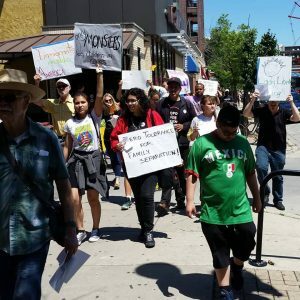 Chicagoans demonstrate in Rogers Park, June 23, 2018, to express their outrage against Trump’s policies. Photo: Franklin Dmitryev for News & Letters. Chicago—Hundreds of people marched in neighborhood immigrants’ rights protests here on June 23. 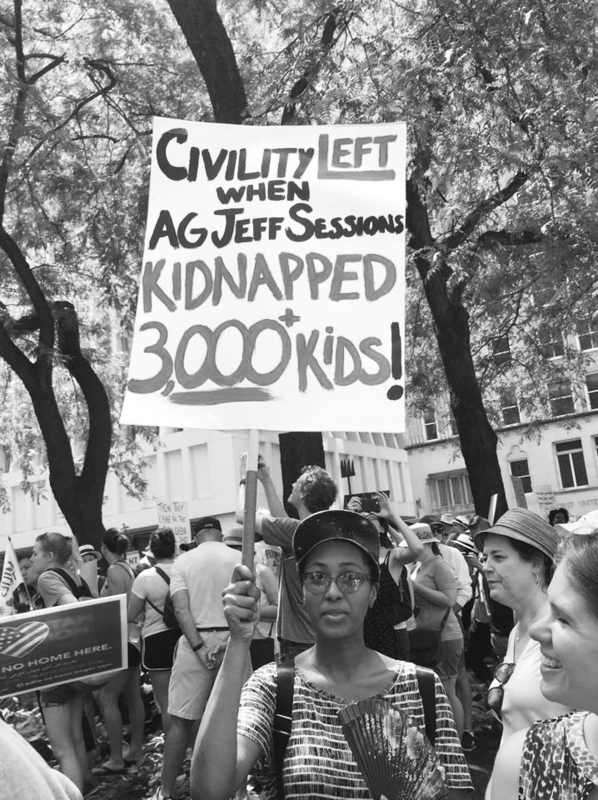 The fact that protests like these are popping up from the grassroots all over the country reflects the breadth and depth of outrage over the Trump administration’s separation of children from their parents at the border. In Rogers Park between 300 and 600 of us walked down Morse Avenue from the el stop and then up Clark Street to Touhy Park, a popular gathering place for people of all races, many of them Latinx, often engaged in soccer games. The support from pedestrians and drivers on Clark Street was overwhelming, with more friendly honking than I’ve ever seen at a protest. Marchers were of all races and ages, from young children to elderly, including quite a few parents pushing strollers. The spirit was passionate and determined, and the event was energizing and restorative, preparing us for the citywide “Families Belong Together” march. Battle Creek, Mich.—I attended a demonstration downtown against Trump’s policy of separating refugee children from their parents at the (in)”justice center,” i.e., jail. There were about 200 people there. It was the biggest demo I have been to in Battle Creek since about…forever. Even during the Vietnam War, all the big demonstrations were in Kalamazoo, 30 miles to the west, which has a large college student population. The demonstration was called by VOCES, a Latinx group. 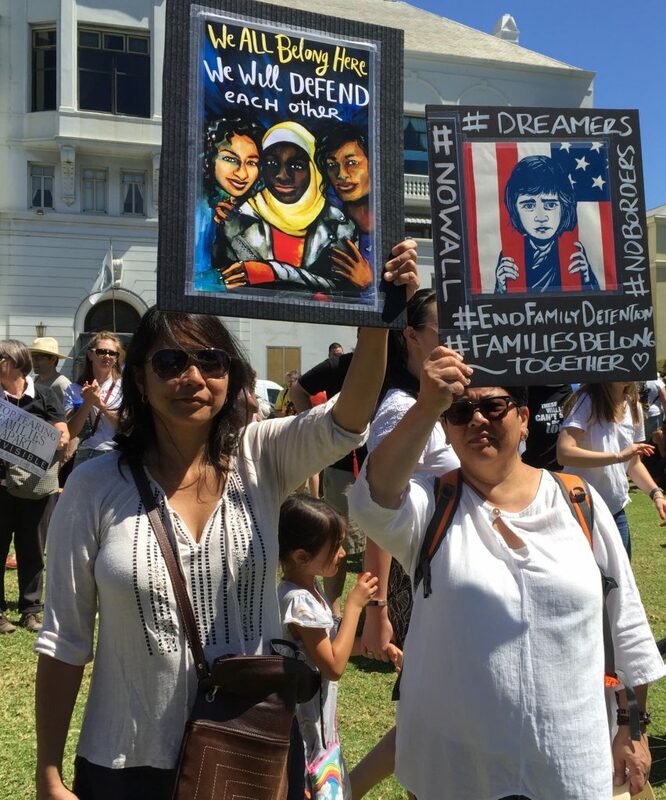 Oakland, Calif.—On June 30, tens of thousands in the Bay Area demonstrated against President Trump’s cruel, criminal and racist separation of families at the border. Demonstrators gathered in Oakland, San Francisco and at the County Detention Facility in Richmond used by ICE. A unique “Families Belong Together” rally of about a thousand at Oakland Lakeside Park was initiated by a ten-year-old girl, Kaia Marbin, who shared her distress with her mother over a photo of a crying child at the border. When her mother, Jyothi Marbin, explained to her what was happening at the border, Kaia organized this “kid-led” rally. Kaia and other young people spoke, including Evelyn, who said this has been happening for years. She related a heart-wrenching account of trying to keep a distant, loving connection with her father, who was taken away from her in an ICE raid. The rally brought out many families who don’t ordinarily demonstrate. Security agents and federal police. With vigils being held frequently, Occupy ICE protestors invite sympathizers to come and show support for those impacted by unjust ICE detention. A “F*** ICE” balloon floated high above a nearby building and candles and flowers lined the altar that sat on the steps in front of a Tesla dealership near the camp. The mood was solemn but communal. A member of the encampment began by speaking about why they were there and committed to abolishing ICE. They had seen the power of collective action and prayer in other Occupy movements and they wanted to see it here. who are trained to kill people of color with impunity. There was a pall cast over the event as DHS agents presided silently over the vigil, standing on the roof of the ICE building with their guns pointed at the crowd. From where we were sitting, they were simply an outline illuminated by the sunset. But we knew why they were there and what they were doing. This entry was posted in Articles and tagged Battle Creek Michigan, Bay Area, Chicago, Clark Street, County Detention Facility, Daley Plaza, Department of Homeland Security, Families Belong Together” march, Immigration and Customs Enforcement (ICE), Liz Fraser, Morse Avenue, Oakland California, Occupy ICE in Portland, Portland Oregon, Richmond California, Rogers Park, San Francisco California, Touhy Park, Trump immigration policies. Bookmark the permalink.